For only $250.00 including installation, you can get into a warm car every day this winter and a cool car in the summer. 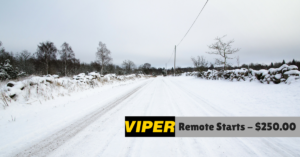 Winter is coming and now is the time to get a VIPER remote start installed on your vehicle. Why VIPER? “Viper is the world’s best selling vehicle security and remote start brand. We use cutting-edge technology to make sure you are in control, providing range and features you can count on every time.” Why us? We are a VIPER “Preferred Dealer”. Quality is definitely our priority with both the installation and brand of remote start for your vehicle. You can be assured that with over 80 years of combined experience in our install shop and a lifetime warranty on the installation, paired with the best brand, back by their lifetime guarantee, VIPER is the only way to go. Call us to schedule your appointment today, 316-943-8444.